For the high-performance versions of the Audi A4, see Audi S4. The Audi A4 is a line of compact executive cars produced since 1994 by the German car manufacturer Audi, a subsidiary of the Volkswagen Group. The A4 has been built in five generations and is based on the Volkswagen Group B platform. The first generation A4 succeeded the Audi 80. The automaker's internal numbering treats the A4 as a continuation of the Audi 80 lineage, with the initial A4 designated as the B5-series, followed by the B6, B7, B8 and the B9. The B8 and B9 versions of the A4 are built on the Volkswagen Group MLB platform shared with many other Audi models and potentially one Porsche model within Volkswagen Group. The Audi A4 automobile layout consists of a front-engine design, with transaxle-type transmissions mounted at the rear of the engine. The cars are front-wheel drive, or on some models, "quattro" all-wheel drive. The A4 is available as a sedan and station wagon. The second (B6) and third generations (B7) of the A4 also had a convertible version, but the B8 version of the convertible became a variant of the Audi A5 instead as Audi got back into the compact executive coupé segment. The first generation Audi A4 (known internally as the Typ 8D) debuted in October 1994, with production starting November 1994 and European sales commencing in January 1995 for the 1995 model year. North American sales later began in September 1995 for the 1996 model year. It was built on the Volkswagen Group B5 (PL45) platform, which it shared with the fourth generation Volkswagen Passat (B5, Typ 3B). It had a front-mounted longitudinal engine and front-wheel drive. Many variations of the A4 were also available with Audi's quattro four-wheel drive system. The A4 was initially introduced as a four-door saloon/sedan; the Avant (estate/wagon) was introduced in November 1995 and went on sale in February 1996. A wide range of engines were available in European markets, between 1.6 and 2.8 litres for petrol engines; and a 1.9-litre diesel engine available with Volkswagen Group's VE technology, capable of achieving a 90 PS (66 kW; 89 bhp) or 110 PS (81 kW; 108 bhp). The 2.6 and 2.8-litre V6 engines which had been carried over from the old 80/90 proved popular, although in North America, the 2.8-litre engine was the only V6 that was available there until 1997. The Audi A4 was the first model in the Volkswagen Group to feature the new 1.8-litre 20v engine with five valves per cylinder, based on the unit Audi Sport had developed for their Supertouring race car. A turbocharged 1.8T version produced 150 PS (110 kW; 148 bhp) and 210 N⋅m (155 lb⋅ft) torque. Moreover, a quattro GmbH special edition of the B5 1.8T was later available in Germany and Europe, for which the engine's power output was raised to 178 PS (131 kW; 176 bhp) and 235 N⋅m (173 lb⋅ft). Five-valve technology was also added to a reengineered V6 family of engines in 1997, starting with the 2.8-litre V6 30v, which now produced 193 PS (142 kW; 190 bhp), followed by a 2.4-litre V6 which was a downsize from the previous 2.6 litre, 150 hp engine, but with a power increase to 165 PS (121 kW; 163 bhp). The B5 marked Audi's continued move into the midsize luxury car segment, having started this trajectory notably with later model years of the preceding Audi 80/90 B4. Despite initial mechanical problems, overall build and assembly quality were lauded both by the automotive press and within Audi and Volkswagen, and at the time, parent company Volkswagen declared the B5 the company-wide build quality benchmark for all its other models. The Audi A4 B5 saw nearly constant minor changes and alterations throughout its seven-year run. Moreover, a significant facelift was introduced for the 1998 B5 model year at the 1997 Frankfurt Motor Show, with sales beginning in Europe in early 1998. The 2.8-litre 30-valve V6 engine replaced the 2.8-litre 12-valve. A 2.5-litre V6 Turbocharged Direct Injection (TDI) diesel engine with 150 PS (110 kW; 148 bhp) was standard on the quattro. A six-speed manual gearbox was available, as well as the new high-performance Audi S4, now part of the A4 lineup (the previous S4 had been an Audi 100). Cosmetic updates included new rear lights, headlights, door handles, and other minor exterior/interior changes. In mid-1998, the 1.8 20vT engine available outside Europe had its power output raised to 170 PS (125 kW; 168 bhp). The previous KKK K03 turbocharger, although fundamentally unchanged, received revisions on the turbine side to prevent cracking due to heat. [citation needed] The 12-valve V6 was replaced by the 30-valve unit which had been available in Europe for two years. In 1999 Audi also debuted an even higher performance RennSport model (rennsport literally translates as racing sport), the RS4 Avant, like its predecessor RS2, available only in the Avant bodystyle. In the Euro NCAP safety and crash tests, the Audi B5 A4 received 3 stars for front- and side-impact protection, but the last star is flagged to indicate that the driver may be subjected to a high risk of chest injury in the side impact. In 1997, Audi was the first European car manufacturer to put a hybrid vehicle into mass production, the third generation Audi duo, then based on the A4 Avant. The next A4, internally designated Typ 8E, debuted on 10 October 2000, now riding on the Volkswagen Group B6 (PL46) platform. 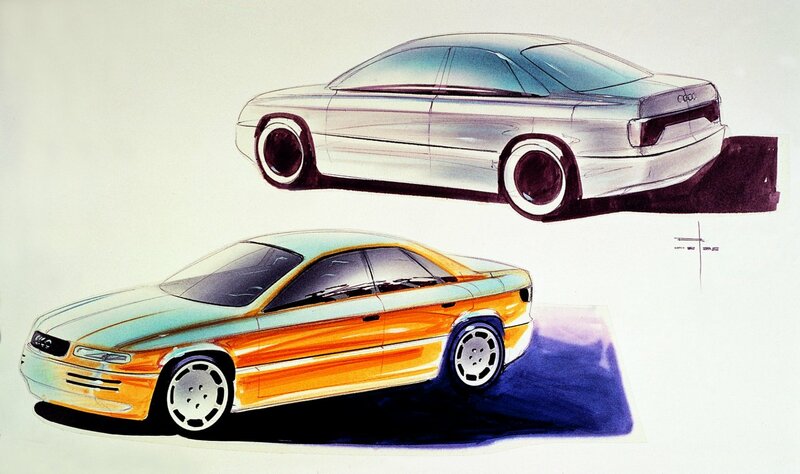 The car's new styling was developed under Peter Schreyer between 1996–1998, inspired by the Bauhaus design language of the C5 (second-generation) Audi A6 introduced in 1997. The 1.6-litre base model powerplant remained unchanged, but most other petrol/gasoline engines received either displacement increases, or power upgrades. The 1.8-litre 20-valve Turbo was now available in two additional versions, with 150 PS (110 kW; 148 bhp) or 180 PS (132 kW; 178 bhp), this one with a standard six-speed manual gearbox, while the naturally aspirated 1.6-litre inline-four engine and 2.8-litre V6 were replaced by 2.0-litre, and all-aluminium alloy 3.0-litre units, still with five valves per cylinder, the most powerful of which was capable of 220 PS (162 kW; 217 bhp) and 300 N⋅m (221 lb⋅ft) of torque. The 1.9 Turbocharged Direct Injection (TDI) engine was upgraded to 130 PS (96 kW; 128 bhp), with Pumpe Düse (Unit Injector) (PD) technology, and was now available with quattro permanent four-wheel drive, while the 2.5 V6 TDI high-end model was introduced with 180 PS (132 kW; 178 bhp) and standard quattro. This generation of quattro consisted of default of 50:50 front to rear dynamic torque distribution. A Bosch ESP 5.7 Electronic Stability Programme (ESP) system, with anti-lock braking system (ABS), brake assist, and electronic brakeforce distribution (EBD) were standard across the range. For 2002, Audi increased power in the 1.8 Turbo engines to 183 PS (135 kW; 180 bhp) and 190 PS (140 kW; 187 bhp) – the 190 PS variant designated by a red 'T' on the boot lid. Available with four wheel drive and in the 2.5 TDI intermediate version to 163 PS (120 kW; 161 bhp). A 2.0 engine with Fuel Stratified Injection (FSI) was also available. A year later, Audi reintroduced the S4, now powered by a 344 PS (253 kW; 339 bhp) 4.2 L V8 engine, as well as an A4 Cabriolet convertible variant (Typ 8H), finally replacing the 80-based Audi Cabriolet which had been discontinued in 2000. It included an electro-hydraulic operated roof, which lowered in under 30 seconds and incorporated some styling changes, such as body-coloured lower bumper and sill panels, which later found their way to the saloon version. Audi introduced a continuously variable transmission developed by LuK, named multitronic, which replaced the dated conventional automatic transmission on front-wheel drive models. The transmission won considerable praise from the automotive press, and is generally regarded[by whom?] as being the best of its type in the world, due to its light weight and promptness in response. [citation needed] This high strength chain driven CVT was made from highly durable metals and used a very high grade, purpose-designed fully synthetic lubricant. However, there have been widespread complaints from consumers around the world that the transmission box is prone to electronic glitches as well as mechanical problems. Borrowing from the Audi A6, the boot was redesigned to remove the extension of the top edge with a smoother fold line. The rear light assemblies now formed part of the top line, these styling cues were eventually borrowed by other European as well as Asian manufacturers. A sport package named 'Ultra Sport' was introduced in the North American market shortly before the B6 was replaced by the B7. It included aluminium interior trim and door sills, "S line" steering wheel, front and rear spoilers, side skirts, and quattro GmbH designed 18-inch RS4 alloy wheels. The Insurance Institute for Highway Safety (IIHS) awarded both the B6 & B7 a "Good" rating in the frontal crash test; the B7 was not retested since the front portion is structurally the same. Audi introduced a revised A4 in late 2004, with the internal designation of B7. Although given a new platform designation, the B7 was essentially a heavily facelifted and revised version of the B6, with revised steering settings, suspension geometry,[specify] new internal combustion engine ranges, navigation systems and chassis electronics (including a new advanced Bosch ESP 8.0 Electronic Stability Programme (ESP) system). The front grille assembly changed to a tall trapezoidal shape in the same manner as the C6 (third-generation) Audi A6; however, the dashboard and interior were virtually unchanged from the B6 aside from minor detailing. The engine lineup received many additions. The 2005 introduction of Fuel Stratified Injection (FSI) on the 2.0 TFSI and 3.2 V6 FSI petrol/gasoline engines, as well as other refinements, increased power output to 200 PS (147 kW; 197 bhp) and 255 PS (188 kW; 252 bhp), respectively. These engines both use a four-valve per cylinder configuration. The prior 5-valve design was incompatible with the FSI direct injection system (due to the siting of the fuel injector, now discharging directly into the combustion chamber). The 2.0 Turbocharged Direct Injection (TDI) diesel engine now combined Pumpe Düse (Unit Injector) (PD) technology with 16 valves, while the larger 2.5 TDI V6 diesel was superseded by a 3.0 V6 TDI, offering a 204 PS (150 kW; 201 bhp) model during the year 2005 which was upgraded to a 233 PS (171 kW; 230 bhp) model in 2006. A 2.7 V6 TDI was added later. Torsen T-2 based quattro permanent four-wheel drive remained as an option on most A4 models. Audi retired its 5-speed manual transmissions in favour of a new Getrag 6-speed. As before, multitronic continuously variable transmission (CVT), now with selectable 'seven-speeds', was an option on front-wheel drive models, whilst a conventional ZF 6HP 6-speed tiptronic automatic transmission was an option on the quattro four-wheel drive models. In addition to the Audi S4, which carried over the powertrain from the B6 S4 – Audi reintroduced the quattro GmbH developed Audi RS4 (RS for RennSport) to the lineup, for the first time on the saloon/sedan and Cabriolet body, and with a naturally aspirated, but high-revving 4.2-litre V8 FSI engine. Another notable[according to whom?] inclusion on the RS4 is the latest generation Torsen T-3 quattro 4wd system, which uses a 'default' asymmetric 40:60 front-rear dynamic torque distribution bias. This new asymmetric centre differential was initially only available on the RS4, but was added a year later on the S4. The remainder of the B7 A4 range still used the T-2 50:50 default dynamic split centre diff. A variant, developed by quattro GmbH, was first introduced in May 2005, named "Audi A4 DTM Edition". It was inspired from Audi's race cars of the 2004 Deutsche Tourenwagen Masters, and was reintroduced in 2006 as a regular option. The 2.0T FSI engine received revised software mapping to the ECU, which increased the output to 220 PS (162 kW; 217 bhp) and 300 N⋅m (221 lb⋅ft) of torque. It was available with front-wheel drive, or quattro four-wheel drive. According to 2007 Swedish vehicle inspection data, the Audi A4 Avant with diesel engine is the most reliable vehicle available on the market, with vehicle inspection rejection rate of 0.0% in three-year-old category. When the successor B8 A4 range was introduced, the B7 series A4 was restyled and rebadged as the SEAT Exeo in 2008 with changes to the front and rear plus interior trim from the A4 Cabriolet. The entire Audi B7 A4 production line from Audi's Ingolstadt plant was dismantled and sent to Volkswagen Group's related SEAT factory in Martorell, Spain. The Audi A4 offers many standard safety features, including Bosch ESP 8.0 Electronic Stability Programme (ESP) with anti-lock braking system (ABS), side airbags in the seats, 'sideguard' curtain airbags, and its optional quattro four-wheel drive system. It also received the Insurance Institute for Highway Safety (IIHS) "Top Safety Pick For 2007". EuroNCAP crash test results from the B6 apply to the B7 model. Audi released the first official pictures of the B8 series A4 in August 2007, and unveiled the car to the public at the September 2007 Frankfurt Motor Show. Saloon/sedan and Avant (estate/wagon) models are offered. The Avant was unveiled to the public at the March 2008 Geneva Motor Show. For North America destined models, the B8 continued in production for the 2016 model year, while Europe began deliveries on the 2016 B9 model. The B8 A4 is built on a variant of the Audi Modular Longitudinal Platform, a platform which is also used in the Audi A5 coupé. Whilst prior A4 chassis were limited in wheelbase due to the relationship between the engine, transmission and front axle, the MLP allows for a reduced front overhang, resulting in a greater wheelbase length without the same increase in overall length. This effectively redistributes the centre of gravity slightly rearwards, improving handling by better balancing vehicle mass between the front and rear axles. The estimated static front:rear weight ratio of the B8 A4 is approximately 55:45, depending on body style and engine. The relocation of the steering rack in front of the axle also improves handling over previous A4 platforms. [citation needed] Key to the implementation of MLB is the novel mounting of the differential in front of the clutch. This is achieved by driving the flywheel/clutch remotely by means of a 'top hat' shaped drive plate, between which the differential lay shaft passes, whilst power transmission to the final drive is via an inclined transfer shaft which runs the length of the transmission unit. Whilst the platform retains Audi's "overhung" engine mounting position, the front axle is now 152mm further forward than the previous B6/B7 generation platform. The transfer shaft, however, has the effect of creating a large "bulge" on one side of the transmission tunnel, which on right-hand drive versions forces the pedals to be badly offset, which has attracted criticism from the British motoring press in particular. Reception has been mixed, with praise for the Audi A4's increased size, giving it best-in-class rear legroom and trunk space in the compact executive car segment. Its inline-4 2.0 TFSI engine, while efficient providing plenty of torque, was considered lacking and less refined compared to 6-cylinder engines of lighter rivals who posted faster acceleration times. However, the Audi S4 sports sedan has been well-received for its V6 3.0 TFSI engine's power and efficiency. Audi released the first official pictures of the B8 series A4 in August 2007, and unveiled the car to the public at the September 2007 Frankfurt Motor Show. Saloon/sedan and Avant (estate/wagon) models are offered. The Avant station wagon / estate was presented at the March 2008 Geneva Motor Show. The A4 allroad quattro features a wider track, increased ground clearance, quattro permanent four-wheel drive, a distinctive radiator grille, stainless steel underbody guards and roof rails. The A4 allroad quattro was made available in early summer 2009. The car was unveiled in 2009 Geneva Motor Show. The quattro permanent four-wheel drive system uses the latest Torsen T-3 centre differential, with a default 40:60 front to rear asymmetric torque distribution ratio (used first on the B7 RS4) as standard. (Previous A4 quattro models split torque with a default front:rear 50:50). The additional torque bias applied to the rear wheels helps mimic the driving dynamics of rear wheel drive cars. All petrol engines use Fuel Stratified Injection (FSI), and all diesel engines use the common rail fuel delivery (with a pressure of 1,600 bars (23,000 psi)), with piezo injectors of their Turbocharged Direct Injection engines. In 2009, Audi announced the seven-speed dual-clutch S tronic transmission as option for A4 in UK and European markets. All A4L models include Speed 8 multitronic continuously variable/manual transmission, except for A4L 3.2 FSI quattro, which includes Tiptronic automatic transmission. It includes a common rail 1,968 cc (120 cu in) TDI diesel engine rated at 120 PS (88 kW; 118 hp) and 290 N⋅m (210 lb⋅ft), a stop-start system and regenerative braking. It can achieve a fuel consumption of 3.99L/100 km (58.95 mpg) and CO2 output of 105 g/km. It can accelerate 0-100 km/h (62 mph) in 10.7 seconds, with top speed of 206 km/h (128 mph). Other features include electric motor-based power steering, revised aerodynamics, low-rolling resistance 225/45R17 tyres, and electric actuation of the rear brakes. The car was unveiled in Paris Motor Show. The facelift model Audi A4 came in 2011. It features redesigned LED headlamps and tail lights, front air dam with fog lamps, and closely set twin exhausts. Interior changes include bluetooth connectivity for audio streaming (nav equipped models only) and a redesigned ignition key. Controls for air-conditioning, infotainment, and power windows gain chrome clasps. Other detail interior changes include larger steering column stalk switches first seen in the D4-series Audi A8 and a simplified layout for the HVAC control panel – for example the temperature setting for the heated seats is now directly set by a single button and is no longer controlled using the MMI dial. The A4 includes radio with eight speakers as standard, while MMI navigation system with voice dialogue is optional. A new "Drive Select System" allows drivers to choose comfort, dynamic, individual, or efficiency modes for fuel efficiency. Power output of the 1.8 TFSI engine is 170 BHP and 320 Nm of torque – up 10 BHP and 70 Nm from the previous versions. Electro-mechanical power steering is standard. The next-generation B9 version of the A4 was revealed in June 2015 – the fifth model to carry the A4 badge, and the ninth generation of the Audi 80/A4 series overall. Pre-production versions were released to the motoring press, whilst the official launch occurred at the Frankfurt Motor Show in September 2015. The B9 is slightly larger than the outgoing B8, but Audi claims the new A4 is around 120 kg (265 lb) lighter than its predecessor. Timo Scheider driving an Audi A4 DTM 2009 (R14 plus) at the Hockenheimring. Audi Sport re-entered the Deutsche Tourenwagen Masters (DTM) series in 2004 (after having privateer teams run the Abt Sportsline Audi TT-R) with a V8 engined silhouette racing car resembling the A4 saloon, known as the Audi A4 DTM. A4 DTM cars are identified by Audi Sport "R"-prefix designations. Brad Jones won the Australian Super Touring Championship in both 1996 and 1998 driving an A4. The A4 was used in the 1996–1998 and 2011-2015 British Touring Car Championship seasons. The A4 was used in the 2000–2001 European Super Touring Championship season. A4 drivers won the Italian Superturismo Championship in 1995 and 1996. Drivers in an A4 won the 2001, 2002, 2003 and 2006 Swedish Touring Car Championship season. The A4 was entered into the 1995 Super Tourenwagen Cup season. The car was used in the 2006 Russian Touring Car Championship. The A4 was used in the SCCA World Challenge for several years. ^ Steinert, Christian (22 August 2006). "Audi: New sales division in China". The German Car Blog. Retrieved 26 December 2010. 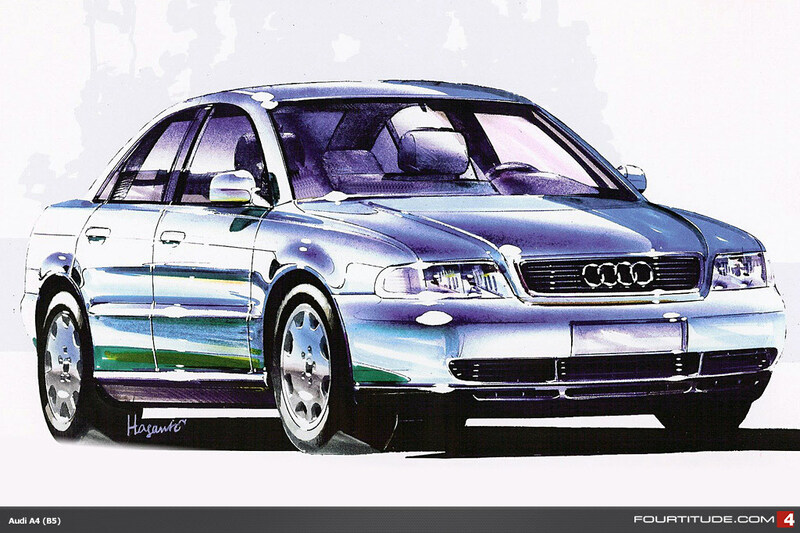 ^ "A history of Audi – The 1990s" (PDF). Audi UK. Retrieved 2017-03-05. ^ "Design skecht front quarter view" (JPG). Retrieved 4 June 2018. ^ Neil, Dan (7 January 1996). "BEHIND THE WHEEL/Audi A4 Quattro;Athletic Overachiever at a Garage-Sale Price". The New York Times. ^ "Design sketch of exterior" (JPG). Retrieved 3 June 2018. 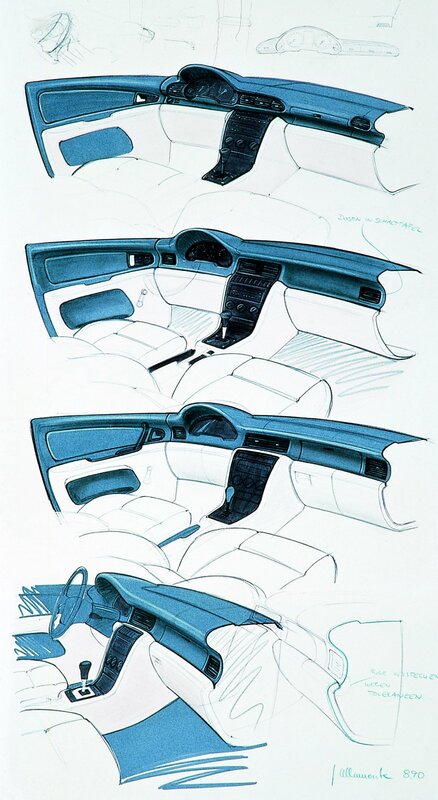 ^ "Design sketch of dashboard" (JPG). Retrieved 3 June 2018. 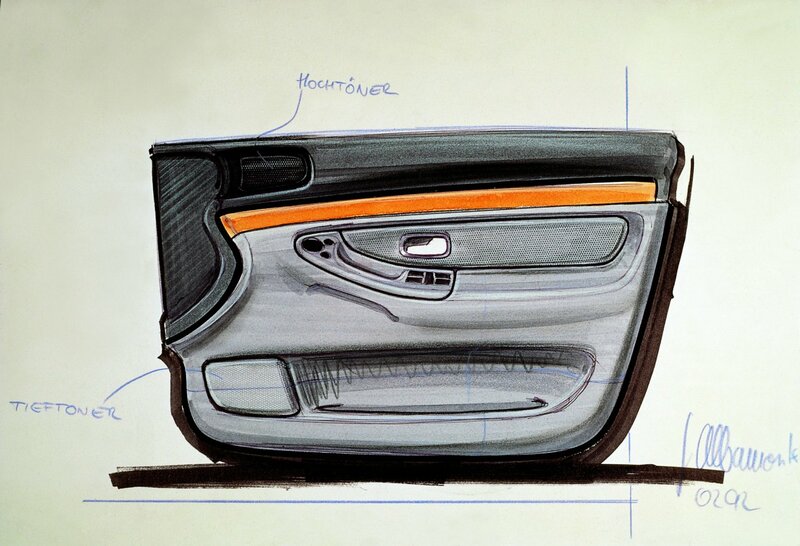 ^ "Design sketch of door panel" (JPG). Retrieved 3 June 2018. ^ "Audi A4". EuroNCAP.com. Retrieved 1 June 2008. ^ "Audi Gearbox Problems". Retrieved 2012-04-15. ^ "CVT reality check". Retrieved 2012-04-15. ^ "Audi A4 specification". 2011. ^ "Audi A4". EuroNCAP.com. Archived from the original on 5 July 2008. Retrieved 1 June 2008. ^ "IIHS-HLDI: Audi A4". Iihs.org. 24 October 2007. Archived from the original on 5 November 2010. Retrieved 11 October 2010. ^ Kirk, Julian (4 November 2008). "Seat Exeo (2009) CAR review". Car Magazine. Retrieved 13 January 2009. ^ "Audi A4 CKD assembled in India too". ^ "Audi A4: the design". carbodydesign.com. ^ Audi A5 – Self Study Programme (PDF). Audi AG. January 2007. p. 30. Archived from the original (PDF) on 5 January 2015. Retrieved 5 January 2015. ^ Rutherford, Mike (6 November 2007). "Audi A4 replacement: Hot and cool". iol.co.za. Retrieved 11 May 2011. ^ Ulrich, Lawrence (27 December 2009). "A Holiday From Wishful Thinking". The New York Times. Retrieved 2 May 2010. ^ Ulrich, Lawrence (8 February 2009). "A Class Act Matures in Size and Price". The New York Times. ^ "2009 Audi A4 Review, Prices, Photos". New Car Test Drive. Retrieved 11 October 2010. ^ "MY10 changes for Australian Audi range". Ozaudi.com. Retrieved 2011-05-16. ^ Filipponio, Frank (17 November 2008). "Audi intros long-wheelbase A4L for China". Autoblog.com. Retrieved 2010-10-20. ^ "The Audi A4 allroad quattro: A Vehicle that knows no Boundaries". www.audi.com. Audi AG. 15 February 2009. Archived from the original on 21 February 2009. Retrieved 2009-02-23. ^ Paukert, Chris (3 April 2009). "Geneva 2009: New Audi A4 Allroad debuts, reportedly may come to U.S. after all". Autoblog.com. Retrieved 2010-10-20. ^ Lavrinc, Damon (22 April 2009). "Audi dropping 3.2-liter V6 from 2010 A3, A4 and TT". Autoblog.com. Retrieved 2010-10-20. ^ "Audi CVT Suit Settlement Given Green Light". The National Trial Lawyers. ^ "2009 Audi A4 3.2 quattro sedan Review". Automoblog.net. ^ "Audi A4". EuroNCAP.com. Archived from the original on 31 May 2008. Retrieved 2008-05-29. ^ "2012 Audi A4 4 DR FWD". safercar.gov. ^ "AutomobileMag.com". AutomobileMag.com. Retrieved 2010-10-20. ^ "High tech all the way – the new Audi A4 and A4 Avant". www.audi-mediacenter.com. Audi AG. 4 September 2015. ^ a b "2015 Audi A4 - latest pictures and details - Autocar". www.autocar.co.uk. ^ "Three Generations of Audi A4 DTM Cars". Audiworld.com. 27 March 2006. Retrieved 1 June 2011. Wikimedia Commons has media related to Audi A4.